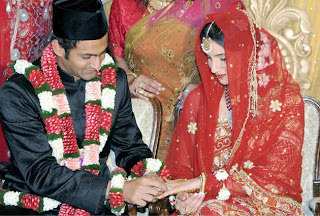 Indian Tennis Star Sania Mirza is finally got married to Pakistani Cricketer Shoaib Malik today in Taj Karishna Hotel of Hyderabad after so many controversies. Sania was wearing Red dress of her Mother that she wear 25 years ago on her marriage. Media was not allowed to go inside hotel so no Video of Nikah has yet came on Media. Sania Mirza and Shoaib Malik are officially a couple now but the Mehndi, Welcome Function and Walima are still left. Mehndi will take place tomorrow on 13th April while Welcome Function will held on 15th April in which different Bollywood Stars and Cricketers will come. Date of Walima is not yet decided that will take place in Lahore Pakistan.